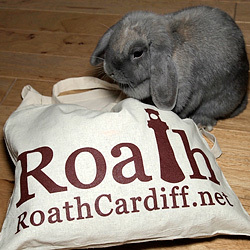 Written for RoathCardiff.net by David Lloyd. Given the state of its fast deteriorating structure, I can’t see things ending well for the old Gaiety building on City Road. I hope I’m wrong and it can be saved from its current sorry situation, but I fear it might go the way of its sister in Splott and be another victim of a convenient mystery fire (a fate that befalls many old Cardiff buildings that have been deserted and left to rot) or demolition to make way for yet more bland, faceless housing units. It wasn’t always that way though. Given its current dereliction it’s hard to picture the vibrant place it was through most of the 20th century. You’d daily see large queues waiting to enter for one of the many leisure purposes it served over the years, looked over by its distinctive stately twin domes. Built as the Gaiety Grand Cinema and opened in 1912, it was initially able to seat 800 patrons and I believe also featured a roller rink. 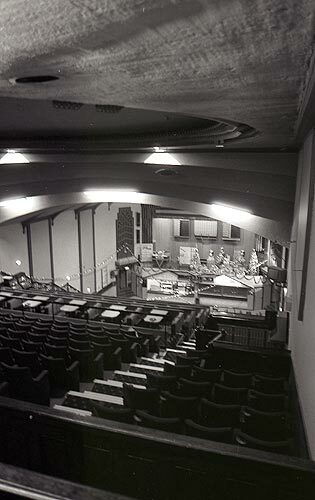 In the 1930s it was enlarged and given a balcony, and then continued as a cinema up until the big drive to bingo hall conversion in the 1960s. You can read more about its cinema history here. I know it best for its time as a bingo hall. I think it was a Coral Bingo Hall for a period, then in 1976 it became a Top Rank Hall with a capacity of approximately 750 people. I worked there whilst it was a Top Rank club from 1989-1992. 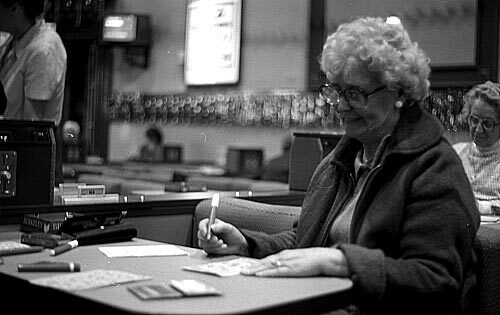 Afterwards it continued as a Mecca Bingo club up until 1998 when it breathed its last as bingo venue. 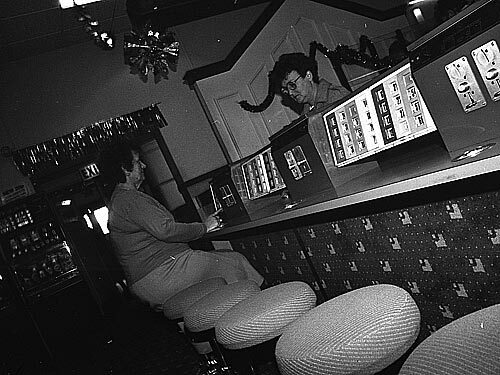 Its decline as a bingo hall can be directly linked to the new big bingo halls that opened up around Cardiff in the late 1980s, early 1990s and offered bigger prizes thanks to their bigger capacities (Castle Bingo’s Newport Road and Canton halls especially were drawing customers away). I think it’s fair to say the rot set in when it gave up its purpose as a bingo hall. Up until then it had been your typically old style cinema with a balcony and large seating area on the ground floor. 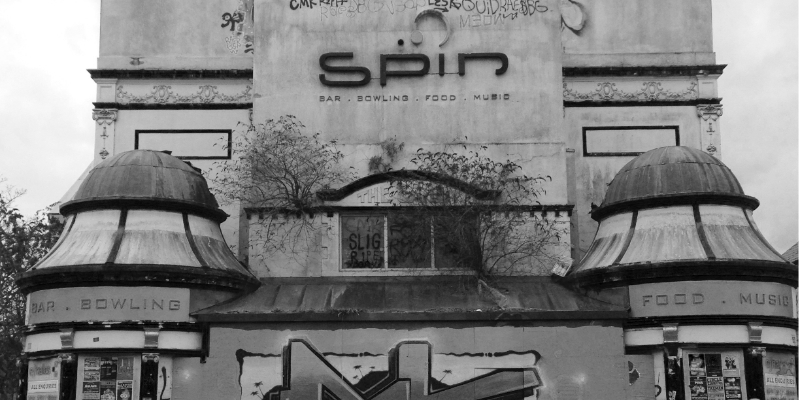 When Spin took it over in 2001 they made major changes to the interior, adding a floor where the balcony was to create a bowling alley, cutting the hall in half horizontally, and gutting lots of the features that had been there since its bingo days. You can see the interior photographed in an urban exploration and get an idea of the damage done here. Spin never worked out, and the building’s been suffering since they closed and the shutters went up. With squatters taking residence, a rainforest sprouting on the outside of the building and graffiti all over it, many are now calling it an eyesore. Me, I think it’s still beautiful: the building is an inseparable part of my DNA, as is the old Globe Cinema that stood on Albany Road, and the Splott Bingo Hall. These grand palaces continue to fascinate me and often sneak into my thoughts, reminiscences, work and dreams. You just need to mention their names and my eyes mist over and my heart swells. These buildings had character, and they filled me with joy both from the events there and their aesthetic appeal. As for the Gaiety, my earliest memory of the building was sitting in a pram there, I think it was a Saturday afternoon circa 1975. I don’t know what I was doing there, if my mum was visiting someone, playing (were people allowed to bring children to bingo in the mid 1970s?) or passing through. The tyrannies of early memories mean I can’t be sure, but the one thing I remember is the cigarette smoke making me feel unwell. Then as time went on, the Gaiety made its presence felt in my life in other subtle ways. Parents and grandparents would often disappear for a few hours, then there were the excited tales of wins, and we’d always have a surplus of bingo markers for childhood art projects, all of which can be directly linked to the hall. Through my teen years it took on a new significance as I got a job there, and suddenly everything was bingo. It was just a menial job to start with as a floor walker and change giver. The uniform was ghastly, bright yellow and blue and itchy nylon, but the hall was great to look at and a great space to move around. The work was hard at times, but I was always able to have a good laugh with the members. As time went on I was trained to call the party bingo games played in the intervals and then moved up to the main stage and games. I don’t think I was a particularly good caller (monotonous if truth be told), but I got on with it and often ended up covering for the main caller Jack on his nights off and holidays. Calling main stage was always a bonus as I got a nice little pay rise for the sessions I did as the caller. I think the busiest night I called was one of the party nights when there were about 700 people in, all eyes on me and murmurs murderous when I didn’t call their numbers. During the three years I was there I was also studying art at Howard Gardens (another great building gone). I’d occasionally use the place as grist for my creative activities making photos and sketches around the place. It’s fair to say nothing I made there was particularly impressive, but I do have fond memories of spending one Christmas Eve up in the dark in the closed off balcony section, sketching the building and the neon lights. As a source of inspiration the Gaiety reared its head several times in my creative output from writing to art to photography. 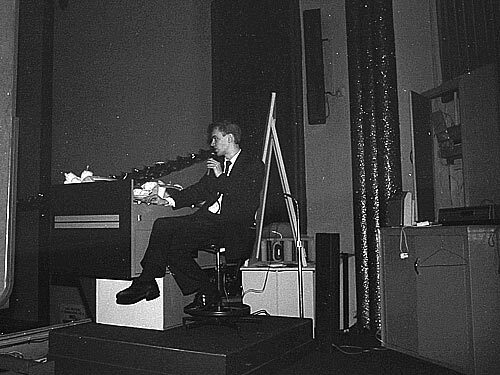 There’s some very poor photos I took during that period, circa 1991, of which more can be seen here. I had a real fondness for the characters at the club, the die hard regulars who came to play no matter what, and usually sat at the same tables lest someone got there before them in which case there were sour faces all night! Upstairs by the edge of the balcony where I’d often steward were Pat, Hilda and Helen. We’d often have a good moan about proceedings, and I’ll never forget when Pat had an early call on the National Game that meant she potentially could have been in for a big win, but only got the regional. She gave us each £2 as if to say, there that’s all you’re getting. Cardiffians might remember the late local legend who went by the name of Shaky Hands Man. Well, before he got the shaky hand reputation, he’d turn up at the club with his brother and brother’s wife who’d sit in their usual spot up on the balcony. He wouldn’t play bingo, but he’d sit with them whilst they did. For us callers he was a nightmare as he’d nod off to sleep, then wake up mid game with a start and shout out aloud, causing numerous false calls and stoppages in the game. Downstairs there were so many regulars that I could name and tell stories of but we’d be here for days. Instead I’ll just mention some of the more familiar ones to me. The best known was Lil, she’d always be there in the same place just by the stairs mid way down the ground level. She was always with her friend whose name slips my memory (Betty? ), but they were a scream and we’d talk for hours. Often near to them would be Gary and his partner. I’d bump into Gary many times over the years as he became a respected casting director and we both worked at the BBC together, but back then he’d tell me all about being an extra on Pobol Y Cym and the other acting work he did. Sadly he died last year, way too young. Then there was Veronica, whom I think was one of the luckiest women in Wales, she literally had a win most nights. It was incredible, every time she called house you’d hear a collective tutting come from the rest of the audience. She’d often play with her friend Sian, who despite being twice our age at the time was a woman my best mate had a major crush on. He’d often come to the club to meet me, but I suspect it was as much to dream of ‘what if’ with Sian. But there was one gentleman who was there pretty much every night that I will never forget. He’d sit in the same seat every day, often afternoon and night. His name was Mr Price, an elderly gentleman tall, thin and full of character. He made such an impression on me that at one point I made a short story pretty based on him and his tales and mannerisms. You can read it here. As well as the customers, there were many a staff member that demanded a mention. Fellow teenager and party animal Ravi, we’d wind each other up and often walk home together, a true gent. Then there were the party bingo girls, whom I mostly worked with. We’d often hide out together in the back office during the main sessions counting the 10p pieces that had been pumped into the party bingo and drinking Southern Comfort. Ann, Jeanne, Debbie, Pat and Val – we’d literally have a scream backstage for 30 minutes, then hit the floor to manage the party bingo games for the punters. And on the other side were the girls who sorted the main stage bingo prizes and book sales – Uma and Sue. I’d share many a bus ride into town with Uma, and would often call out the racists on Cardiff Bus that called her the P word, idiots. And Jack, the mainstage caller. I wish I could recall his surname, but he was legendary (at the club at least). He’d be decked out in his swanky calling tuxedo (I never got to wear one), and command the attention of everyone in the hall with his suave demeanour. There was an ongoing legend at the club that the old derelict projector room held a mattress that Jack would have for personal use in the intervals (nudge, nudge). 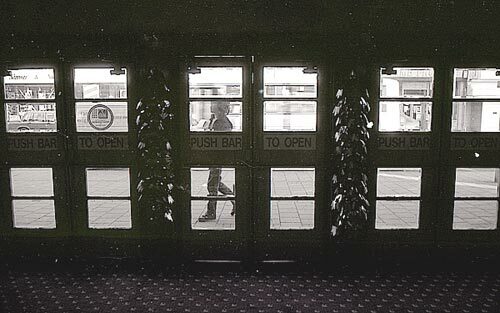 However, I never saw Jack disappear with one of the female patrons so can only assume it was rumours and nothing more. And then Eunice, queen of the bar and canteen. Sundays I’d work all day following a Saturday night spent at Radcliffe’s Square Club on Westgate Street in town. Usually I wouldn’t eat from tea on Saturday till tea on the Sunday as I would be back late, fall out of bed Sunday lunch with only enough time to get to work and little else. But when I did eat on that Sunday after the afternoon session, it was always chips, two sausages and gravy, supplied by Eunice. It was literally the best meal of the week. Every. Week. So now I look at photos of the place, and literally my heart hurts. If I was a millionaire, I’d snap it up. I’d rid the building of the fauna and graffiti, I’d restore the balcony seating and cinema layout. I’d weatherproof the building. I’d stop the rot. I’d paint it. I’d love it. I’d give it a new lease of life and make it a place people once more queued up to get into. But I wouldn’t burn it, or demolish it, or turn it into flats. I’d make it something the community could once more use and enjoy. But that’s the problem. I’m not a millionaire, so I can’t save it, which means I have sit by and watch it rot. It could be the Chapter of Cardiff East, and I’d be well behind that. What a great way to keep it breathing. But that’s for the council and money people to decide, which sadly means yet another Cardiff temple of pleasure is doomed to the annals of history. Such a real shame. 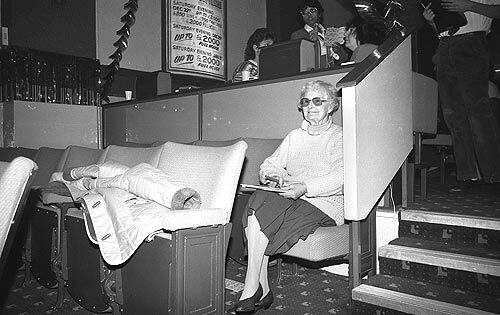 David Lloyd has written about the history of many Bingo Halls in the Cardiff area. You can read more on his website here. Photos used with kind permission of David Lloyd.